Die 31. Ausgabe des HispaBrick Magazins kann nun kostenlos heruntergeladen werden: Die Dinos sind los. Jetro hat uns eine Pressemitteilung zukommen lassen, die wir gerne teilen: Die RLFM-Kollegen aus Spanien haben die 31. Ausgabe ihres lesenswerten HispaBrick Magazins veröffentlicht. Die Ausgabe kann unter diesem Link kostenlos heruntergeladen werden. Folgend noch der Inhalt auf English. We are back with another issue of HispaBrick Magazine: number 31. In this issue you can see how AFOLs enjoy events in different countries like Japan, (Japan BrickFest), Chile (Brickfest Chile) or Denmark (LEGO® World Copenhagen). 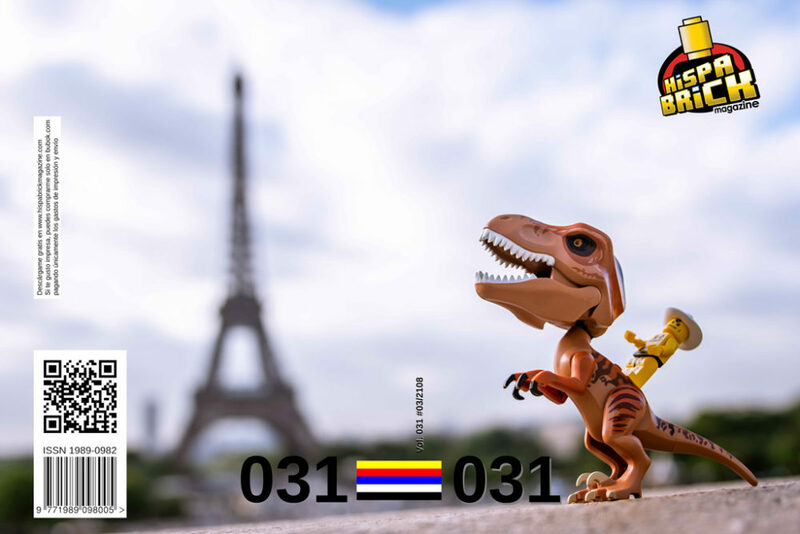 We visit LEGOLAND Japan, Masao Hidaka shows us how you can build a monorail with current LEGO pieces and Julien Ballester tells us about Stuck in Plastic’s annual toy photography safari, this time in the city of París. In our interview section we talk to Jamie Berard, design manager specialist for Creator Expert and LEGO Architecture and we meet Quinten, winner of the 2018 LEGO Ideas Trophy Design Contest. In the KOCKICE Corner we have another instalment of the Minidolls vs Minifigures comparison, a review of LEGO Architecture Skylines and an article about the different animals LEGO has produced. Of course there are also EV3 and Boost tutorials, reviews and much more.